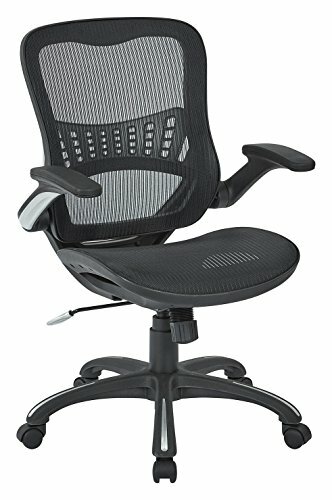 Your Work smart breathable screen back chair combines durable, sturdy aesthetic with ultimate comfort. A sharply designed nylon frame braces a mesh screen back that delicately cradles the curves of your spine with built-in lumbar support. You'll have full control over your chair with the accommodating range of 2-1 synchro locking tilt control with adjustable tilt tension. One-touch pneumatic seat height adjustment and padded flipping arms with silver accents provide further customization of a chair designed with up-to-the-minute technology. A heavy-duty base with silver accents and dual wheel carpet casters completes a sleek home or office addition accomplished with style and professionalism. GREENGUARD® certified for better indoor quality. Manufactured with reduced harsh chemicals and with processes that are 'low VOC' (low in volatile organic compounds).